Neil is responsible for seeking, securing, and managing commercial opportunities for research income development. He identifies potential intellectual property (IP) and opportunities for exploitation, and advises on preparation of grant applications, proposals and tenders in relation to commercialisation and exploitation potential. 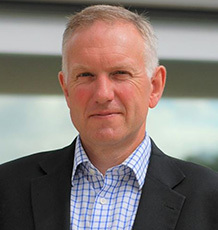 He leads the IIB Commercial and Business Programmes team who are responsible for KTP's, Contract Research and Consultancy projects and managing translational funding streams. Neil joined the University in 2010, having previously worked as project manager for the Manchester Centre for Integrative Systems Biology. Past roles include New Product Introduction, Research and Development and Operations management. Neil has worked for various sized enterprises from large multinationals to SMEs, including a spell as a director of a technology spin-out. His experience spans a number of sectors including materials science, surface coatings and analysis, optoelectronics / telecommunications, sensor systems and biosciences. He has an Honours degree in Polymer Science and Technology, and a PhD in Physical Chemistry.